When it says natural on the outside, there’s also sustainability on the inside. Outstanding skin-compatibility, plus efficacy that sets off natural beauty: these are the principles upon which ANNEMARIE BÖRLIND natural cosmetics have been based for almost 60 years. And during all that time, nature has always been our role model and source of inspiration. That’s why we respect and protect it – from the acquisition of our raw materials right through to the distribution of our products. For example, with state-of-the-art production methods that are both gentle on our products and friendly to the environment, with ingredients whose ethical origins can be traced, and with our commitment to socio-ecological projects all over the world. The EcoControl certification body has also been confirming the high ecological standards of our cosmetics on a regular basis since 2008. See and experience how naturalness and sustainability go hand in hand at ANNEMARIE BÖRLIND. Unmodified natural active substances, such as plant raw materials, come together with environmentally friendly cultivation and sophisticated production methods to form the basis of the high quality of our skincare products. When production that saves natural resources is called for, nature-identical and near-natural substances are deployed. We reject the use of any raw materials sourced from animals. Ingredients that are not easily biodegradable or may be potentially unsafe, such as PEG, paraffins, petroleum derivatives, silicone oils, and polycyclic musk compounds, can neither be reconciled with our claim to effective natural cosmetics, nor with our values. For this reason, we have made a conscious decision to omit them from our products. Carefully selected natural substances and innovative formulas give our cosmetics their unique efficacy and good skin-compatibility. What is more, you can be certain that every one of our products has been developed against a backdrop of maximum ecological and social responsibility. Scientific tests regularly confirm the efficacy and skin-compatibility of our natural cosmetics. We are particularly careful to ensure that every one of our raw materials was obtained under decent working conditions, with fair pay and without the use of child labor. Our products cleanse, strengthen and moisturize, protect, regenerate and care for the skin – and are kind to the environment. Carefully coordinated products make for systematic care at all ages – during the day and at night. Sustainability and careful handling of resources are our top priorities when it comes to harvesting wild plants or obtaining raw materials from primeval forests. Almost 60 years of experience in handling plants, extracts and formulas connect natural beauty with consistent sustainability. Effective skin care from BÖRLIND goes beyond fair trade! Ecological responsibility starts at one’s own front door – but for us, it doesn’t, by any means, stop there. With the targeted purchase of raw plant materials, we support numerous fair trade projects that use ecological cultivation methods, and environmental projects, all over the world. We see this as our contribution to the recovery of the earth and for a world that will also give coming generations a future worth living. For us, sustainability is not a catchword, it’s part of our company philosophy. The cold-pressed ximenia oil from controlled wild harvesting has proved its value for dry skin in particular. What is more, the high proportion of unsaturated fatty acids the oil contains has an anti-inflammatory effect and soothes the skin. By purchasing the oil, we support an initiative that promotes local biological cultivation in eight African states. By purchasing cupuacu butter, we support the Crodamazon project in the Brazilian rainforest. Local wild harvesting helps to give the local communities economic independence. The cupuacu butter is valued particularly because of the high proportion of phytosterols and vitamin E it contains and for its fragrance. The butter also gives products a silky-soft consistency. The KOOFA (Kenyan Organic Oil Farmers Association) Kenya Project, located high up in the Mount Kenya mountains, supports 250 farmers with training in growing and processing organic raw materials. The raw plant materials, carefully processed under observance of strict standards, are purchased at fair conditions so that a substantial part of the supply chain remains in the countries and benefits the local people. Both cultivation and trade are certified and are regularly monitored by independent bodies (Soil Association / Fair For Life). We use these raw materials in numerous products, e.g. sesame oil in ANNEMARIE BÖRLIND’s LL Regeneration series and avocado oil in the Rosentau (Rose Dew) series. The aloe vera that we use in numerous of our products grows in Mexico. The gel from the plant has an anti-inflammatory effect and wound-healing and immunostimulatory properties. The plants originate exclusively from a certified organic grower. In addition, the “fair for life” certificate ensures that the raw materials we use are under constant control and also fulfill strict social, fair-trade and environmental standards. Börlind discovered the Himalayan wild cherry, dhatelo, on the roof of the world. It is used in her natural cosmetics. Old cloister books describe the dhatelo wild cherry from Nepal as being particularly good for the skin. The tall bushes with the almost black dhatelo fruit grow at an altitude of around 4,000 meters in Humla, a region in northwestern Nepal. Börlind founded a rural women’s project to give the women there an income for the first time. 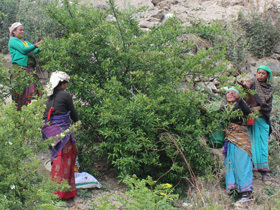 The women in the project gather and process the Himalayan cherries, and we purchase the oil found in our products from them. With our support, they are able to earn a living and educate their children. Social responsibility doesn’t stop at borders. Our social commitment is not always concerned with obtaining raw materials for our products. One example is in Bangladesh. Here, even the daily route to school poses a problem for many children. Long distances and a lack of transport mean that regular attendance is not possible in many cases. Accommodation for the children and teenagers in hostels near the schools is therefore of great importance during the week. We heard about this and donated the money necessary to build a boys’ hostel. This means that it is now possible for boys from further afield to attend the school as well. Beautiful skin and a healthy earth. Whether it’s aloe vera from Mexico, a school hostel in Bangladesh or our own herb garden in Calw, Germany: for us, cosmetics based on naturalness and responsible, sustainable behavior go absolutely hand in hand. We are therefore not only careful to choose suppliers who provide ecological substances of ethical origin, but who also offer decent working conditions, fair pay and do not use child labor. You can be certain that all the BÖRLIND products you purchase are highly effective, skin-compatible natural cosmetics that underline your natural beauty in a natural way. With every cream, lotion or serum you buy, you also contribute to saving resources, respecting nature and making our world a little fairer.